The Honors Program aims to extend and enrich the academic experiences of Baylor students pursuing both traditional and non-traditional (e.g., University Scholars or BIC) degrees. It does so by arranging special Honors classes, including Honors sections of courses required for students' degrees, in the first and second years of study; and then, during the junior and senior years, by facilitating student research. 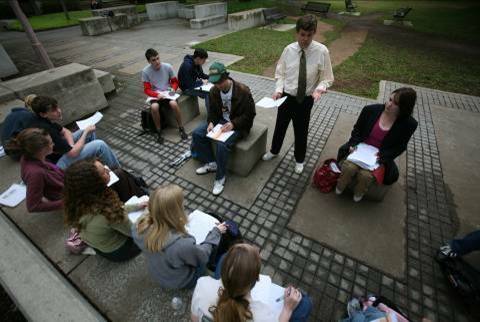 The curriculum of the Honors Program is flexible enough to accommodate students from a wide variety of the university's schools and departments; it combines some specifically required Honors courses (e.g., the distinctive First-Year Seminars and the two required Honors Great Texts courses) with a required number of Honors courses chosen by each student, based on his or her interests and degree plan. The coursework pursued during the first two years, then, usually entails two Honors classes per semester, one specifically required and one other Honors course. Toward the end of the second year at Baylor, each Honors student begins moving toward the upper-division portion of the Honors Program curriculum. This sequence is focused upon work on the hallmark of the program: the senior thesis project, preparation for which includes the Advanced Readings and Research courses taken during the junior year. Whereas the first two years of the program try to foster educational breadth (as does the required Colloquium), the thesis cultivates depth in a particular academic discipline. Click here to discover more details about the Honors Program curriculum.